One of the restaurants that left a huge impression on me is this casual fast-food chain. 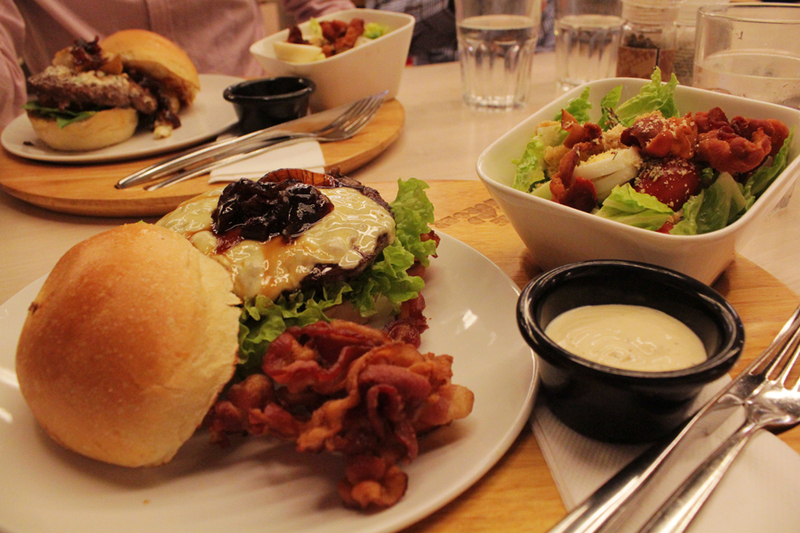 Not only because of the food, but The Handburger (Somerset 313) was where I brought my first date for a simple dinner. Their mains include the burger, a garden salad (with or without bacon) or soup of the day. The salad was refreshing and crisp, but the bacon strips were too hard and chewy for my liking. The cream of chicken with crispy crumbs (soup for that day) definitely makes a better choice. Anyway, I ordered one of their classics, Handburger Original (S$13.80) - 150g of 100% NZ grass-fed prime beef on a bed of crispy lettuce, cheddar cheese, topped up with homemade BBQ sauce and sweet onion jam. The beef patty was exploding with juices, and I want to rave about their toasted caramelised onion bun. It is that good. Crispier than the usual boring buns, it also brings along the frangrance of onions. 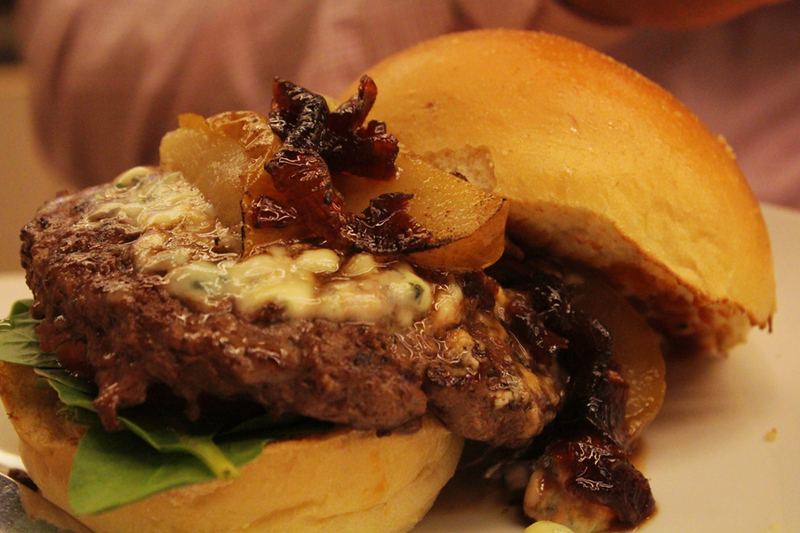 One of my friends ordered the Blue Cheese Beef Burger (S$17.80) - the same juicy patty, topped with roasted pear, blue cheese, homemade BBQ sauce and sweet onion jam. I would recommend the Handburger Original over this though. 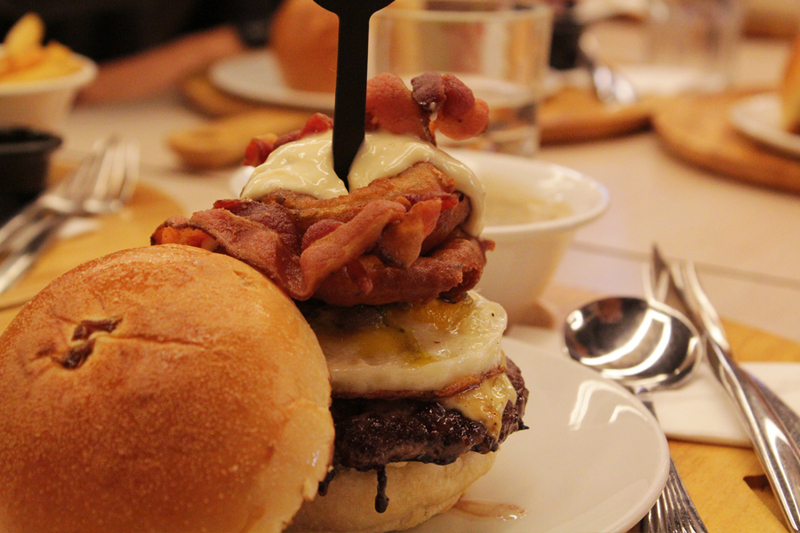 We also had their signature creation, The Works (S$17.80) - same patty, topped with battered onion rings, crispy bacon strips, sunny side-up, sauteed basil pesto mushroom, sweet onion jam, melted cheddar cheese, homemade BBQ and aioli sauce. A little of everything, this ingenious burger is the perfect choice if you are still deciding what to eat after an hour. To complete your meal, add in their Nutella Milkshake with Marshmellow (S$4.50), a chocolatey, thick drink with soft marshmellows to go with. Just to add on, they have a loyalty program (THB Fanatics) designed to reward their diners with points, which can be redeemed to offset future bills, and other special promotions too. Definitely one of the dining places I will frequent occasionally, for old times sake and the affordable, yet quality burgers as well.